Want to make someone's day? Send them a big ole' container of fresh-baked cookies! When the box of Gimmee Jimmy's Cookies arrived to our house, my day was made. It's the simple things in life, right? Gimmee Jimmy's Cookies was founded in 1983 by Jimmy Libman — a dedicated businessman, deaf from birth, but never handicapped by the physical obstacles he faced. He has now passed the responsibility of producing Gimmee Jimmy's spectacular home baked cookies to a small team of successors. They use fresh natural and kosher certified ingredients in their baked goods and their products are shipped fresh daily across America in beautiful cookie tins! Our cookies arrived in a plastic bag inside the tin to preserve freshness and with minimal crumbling from the shipping process. After a careful analysis and sampling of each type of cookie, we came upon one conclusion: Gimmee Jimmy's Cookies makes something for everyone! While you can't beat cookies fresh out of the oven, Gimmee Jimmy's Cookies is definitely the best delivered cookie! Our toddler especially enjoyed sampling cookies with me during our morning "coffee break" (a.k.a. his baby brother's nap time). And that's just the tip of the iceberg! Do you prefer Brownies, Crumb Cake or the classic Oatmeal & Raisin Cookies? Gimmee Jimmy's makes all of those and more! Check out their full list of baked goods on their product page. 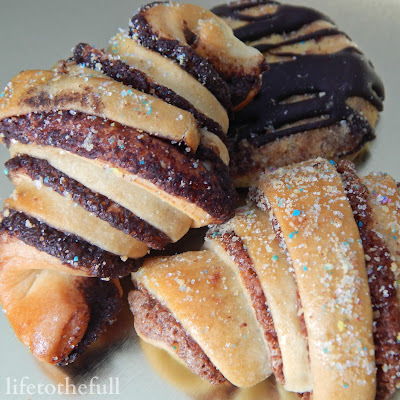 The Cinnamon Rugelach was my absolute favorite and the M&M Chocolate Chip Cookies were a close second in our house. Both varieties were gone very quickly! Gimmee Jimmy's Cookies bakes quality deliciousness delivered right to your doorstep with variety that will suit the taste-buds of every and anyone. Thank you, Gimmee Jimmy's, for the opportunity to review your tasty baked goods! Connect with Gimmee Jimmy's Cookies! I was sent this product to review through my affiliation with the Association of Food Bloggers. All opinions are my own.